Not sure if this already exists, but after quite a bit of searching I couldn't find another mod that does this. 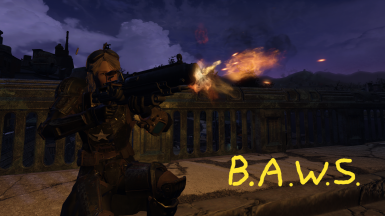 In short, this mod is a simple ESL that replaces the obnoxious looping firing sounds on (almost) all vanilla automatic weapon receivers with the vanilla semi-auto firing sounds making things feel and sound quite a lot nicer IMO. I haven't the slightest idea why this isn't a standard thing in vanilla considering this was absurdly easy to do. This is very very lightweight and only changes the keyword mappings so it should be compatible with basically everything. I made this mostly for Horizon users since automatics are actually useful there and the sound that weapons were making when firing in single or short bursts was driving me insane. I didn't touch the Minigun (I mean I could make a version that does if you like horrific audio clipping), Gatling Laser, Tesla Rifle, or the Institute weapons. Automatic Radium Rifle is WIP as it sound truly awful when changed to the semi-auto sound. Considering a few options to fix it.